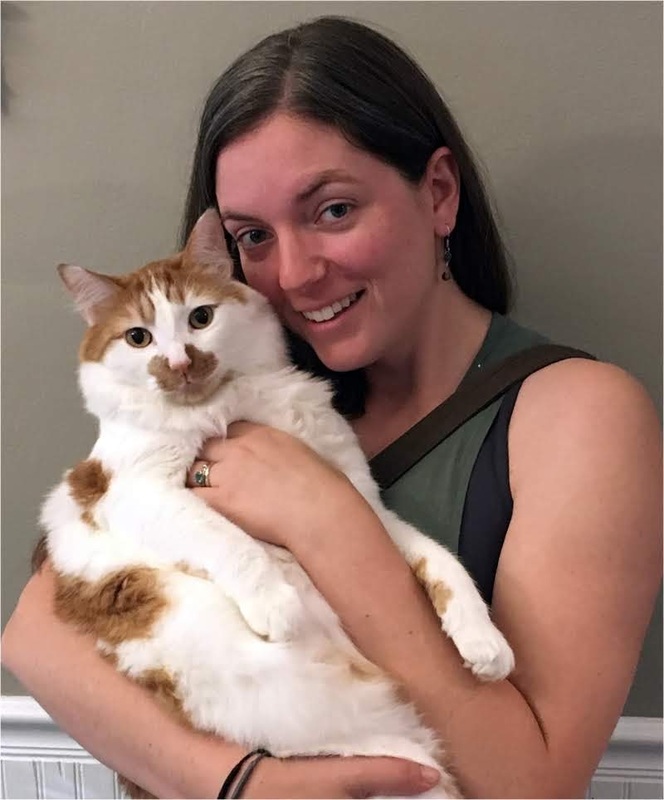 Today we have the pleasure of meeting up with author Amanda J. McGee to talk about Daughter of Madness (2 June 2018, Amanda J. McGee, 249 pages), a Epic Fantasy, book two in the The Creation Saga series. A very warm welcome to Amanda J. McGee; thank you for joining us on BooksChatter! 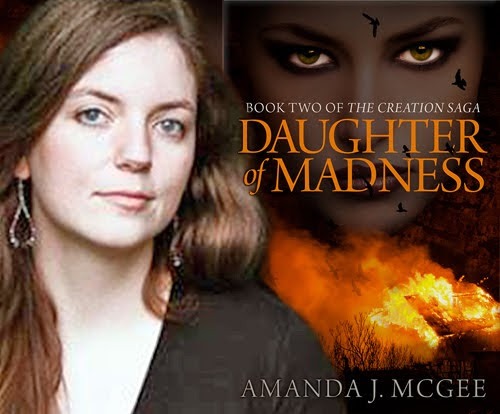 Here at BooksChatter we love music, so Amanda J. McGee has shared with us her music playlist for Daughter of Madness - enjoy! What was the inspiration for Daughter of Madness ? "This book is number two in the series of The Creation Saga. I started writing this series right after I had gotten out of undergrad. I went to a small women’s college and when I graduated I had very clear ideas for how I wanted to make the world a better place. Of course, the world’s pretty big. It doesn’t always want to be better, either. Coming into the real world felt like running into multiple walls that I didn’t have the ability to climb over. How do you stay a good person, how do you make things better when the obstacles seem too big? Can you? I still have that feeling sometimes and I think a lot of people do. I wanted to explore that with these books, and figure out how my characters resolved their own awakening to that feeling." "I’ve probably touched on that a little bit above in terms of my situation when I started the series, but I think in this book especially I really had to start drawing on some of my professional background for my day job, which involves a lot of community work and infrastructure building. I also draw really heavily on sibling relationships - specifically my relationship with my brother growing up, since a lot of times we relied on one another a lot. Sibling relationships move a lot of the conflict in this series." The first thing that draws me to a book is its cover. Can you tell us about your cover for Daughter of Madness - why you chose that concept and who the artist is. "The cover design for this series is from Design for Writers. I really enjoy working with them, they are extremely responsive and tolerant of my hiccups. We picked these design elements to tie the series together - the same focus on eyes, though it’s different character and expression, the same ravens portending conflict, the same dark background. The key colors in the first book were blacks with blues, purples, and whites, and the colors for this book are blacks, oranges, and reds. I hope the final book will include some gold. The blues and whites on the first cover are meant to evoke the goddess Herka that kicks off the conflict, and the red for Daughter of Madness is connected directly to Liana’s fire." Why should we read Daughter of Madness and what sets it apart from the rest? What makes your book unique? "When I’ve talked to fans about these books, they seem to really appreciate the diversity of the characters in terms of age and class. Liana and Liander are your typical young princess and prince at first, of course, but other viewpoint characters include Bertrun, who is the second son of a merchant who joined the Guard and worked his way up, and Nicola, who is first and foremost an ageless imprisoned oracle but who is also the daughter of apple farmers. They’re mostly normal people who had the bad luck to be in the wrong place at the wrong time. The twins deal with very adult issues, as well, so despite them starting off as children and royalty they quickly find that childhood is a luxury they can’t afford and royalty isn’t going to save them. Everyone is subject to fate." Can you tell us something quirky about Daughter of Madness , its story and characters? "The magic system, such as it is, and the gods themselves are inspired loosely on several different myths I was exposed to as a child. I grew up in a pagan household so pluralism was the name of the game. Herkun, for example, holds a place close to the Allfather of Norse Myth in Herkunland’s mythos. That’s probably the most close parallel of the deities in our world, however. I intentionally confuse the myths told in the book because of this background - Herkun has a different name in the deserts to the south, Jassas, and his myths deviate in small but significant ways, just like a god changes name and form when any new civilization encounters them." Who would you recommend Daughter of Madness to and what should readers be aware of (any warnings or disclaimers)? "So I do like to provide a content warning for the first book, Mother of Creation. There is a scene that includes sexual assault. It’s not super graphic, or rather it’s graphic by omission. There are several violent scenes besides, some of which are sexual in nature. So if you have triggers in that area exercise caution. Daughter of Madness does again have one scene where this comes up, but for the most part that is absent in the second book. Additionally there’s graphic violence in both books. That said I think these books would appeal to any reader of epic fantasy or dark fantasy with an epic bent." If you could / wished to turn Daughter of Madness and the The Creation Saga series into a movie, who would be your dream team? "Oh I’m bad at these things, honestly. I don’t really keep up with actors outside of Cate Blanchett. She could totally be Herka. Other than that I would just hope they kept close to character descriptions and didn’t do the thing where all the female characters are always pristine and have perfect makeup even when they’ve been starving, etc." "I write all over the place. I’ve mostly written fantasy or contemporary fantasy, but I’ve been really into science fiction stories lately. I read all of that as well. Anything in the sff span I will take a stab at. My favorite books are diverse, though, with lots of genders and sexualities and ethnicities represented. I’m still getting a handle on how to do some of that well as a writer, and I imagine I will always be learning." "Weeping? Is weeping a process? Just kidding, I think. Usually I am playing in a few ideas at any one time, even once I’ve committed to a story, because my brain likes to fire off cool ideas at inconvenient times. However, committing means structure, so that story accompanies me everywhere and I tend to spend my lunch hours and at least one night a week chipping away at word count. Even if I’m very excited about something, which I usually am, I’m really about a max 1,500 words a day person for a given project. I think the most I’ve ever written in a day was 5,000 and I had to sleep for a whole day after. So it’s slow and steady, mostly, until I get to the editing and rewriting piece which is where I dig in and start pulling twelve hour days during the weekend until I can get the project in shape for release. It’s a lot easier for me to edit or rewrite something than it is to make it from whole cloth." "So I have outlined the next book, title to be announced. It exists in my head. The ending isn’t 100% determined yet so I can’t even spoil it for you! I figure I’ll know what it needs when I get to it. Someone is going to die, and I’m sorry about that in advance. A lot of people are going to die, of course, that’s what happens when there’s a war on, but someone in particular. As for future projects, I’m polishing something lovely right now I really hope I can get a publishing house to pick up, a contemporary fantasy with witches and more of those delicious sibling relationships. It’s a novella, so that’s a hard market but we’ll see. And I’ve got three novels in the wings that I would really like to work on if I ever get time. I’ve written the first chapter and the general ideas for each and they’re at various stages of outlining. I’ve also been churning through a lot of short stories and novelettes recently and I’d like to continue working to perfect short form fiction because it’s a really strange bird to me. Novels make sense, short stories are harder. Also I’m hoping to get an audiobook of Daughter of Madness put together sometime in the next year, but jury is still out on that. There is an audiobook of Mother of Creation already, if that’s your poison." "Oh could I ever. This is my beloved Fidelius, who is a monster and very soft. 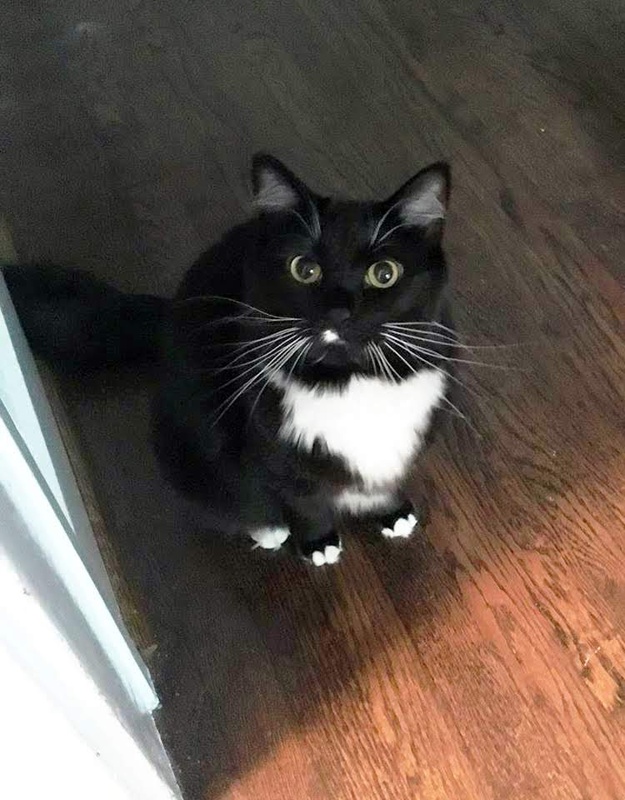 His sister Orca (pictured on the right) and he feature occasionally on my Instagram when they are being very cute, which is all the time, and stand still, which is rarely." Hello gorgeous Fidelius and Orca! Lots of chin-scratches to both of you! Will Liana survive to reclaim her throne? Or will the flames of vengeance consume her? Thanks so much for this! It was super fun! My favorite stop of the tour.